This blog is part of a series of exclusive interviews with the winners of The Fence 2016. The Fence is an large-scale outdoor photography installation exhibited in multiple major cities across the USA. Each year, photographers of all levels are invited to submit work that fits under one or more thematic categories. The Fence was conceived by United Photo Industries and Photo District News in 2011. Claire Rosen says her series ‘Arthropodia’ is a “continued exploration of the cycle of inspiration as well as the tension between nature and mankind." 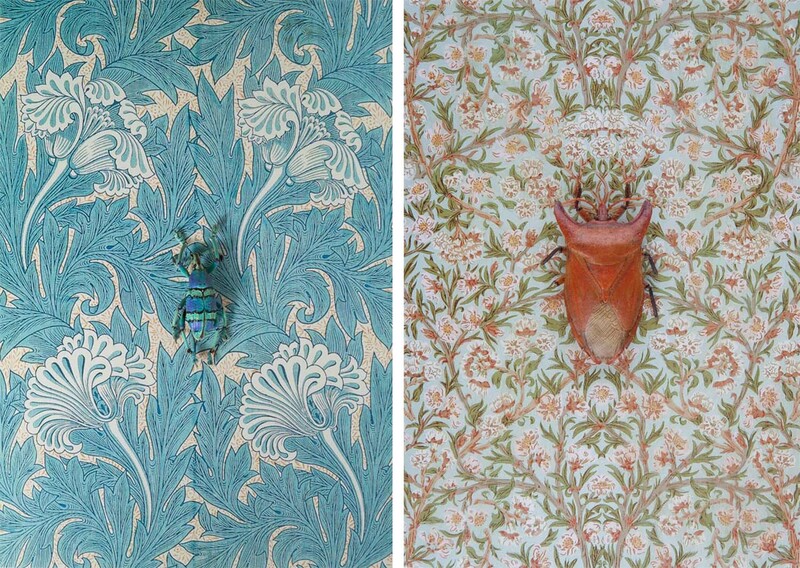 In the series, "preserved insects and butterflies are placed against correlating William Morris wallpaper from the Victoria and Albert Collection creating visual blending and optical illusion." Claire is an award winning artist whose transportive imagery uses universal themes of dreams, fairy tales and mythology to visually symbolize the many facets of the human condition. She has been exhibited from New York to Los Angeles and London to Bangkok and her work can be found in a number of public and private collections. Hi Claire, We can see from your images you have a keen eye for colour and patterns, particularly pre-raphaelite, what is it about this period that interest you? I have always been drawn to the Pre-Raphaelite, Romantic, and Gothic periods of painting as well as the aesthetics of the Victorian Era with its fascination of the natural world and ideals of beauty. I was exposed at an early age to these visuals through frequent trips to the Metropolitan Museum of Art, the Museum of Natural History and bedtimes filled with Grimm’s Fairy Tales, Alice in Wonderland and The Wizard of Oz. I have always been captivated by those narratives and I relate very strongly to the imagery that accompanied them. Those influences left a strong impression on me and inspire all of the work that I produce. You have won multiple awards throughout your career, what do you think it is about your work that interests the judges? Much of it has been pure luck!… I do strive to develop series that are unlike other projects that I have seen before. I employ universal archetypes and make use of classical forms found throughout art history which speak to a wide audience in an attempt to create work that resonates. You have exhibited at The Fence before. These images are quite different from what you showed last year, what made you chose this project? I have been lucky enough to be on The Fence three times before (consecutively since 2013) these images are, in fact, very similar to my first submission, Birds of a Feather, which was on The Fence in 2013. Birds of a Feather featured portraits of live birds ranging from the common Parakeet to the exotic Hyacinth Macaw. The birds were photographed against complementary vintage and historical reproduction wallpaper to encourage optical illusion and visual blending. This series was a catalyst to experiment in a number of offshoot projects featuring other animals juxtaposed with various textiles and patterns. A number of my current series and experiments explore our relationship to nature and the creatures we share this planet with. These portrait on pattern projects in particular address the removal of animals from their natural environments because their habitats have been taken over or because we desire to posses them. This series has less of a ‘set’ than some of your other works, was it nice working on a smaller scale? Did this give you more time to focus on the patterns and colours? Certainly, I like to have multiple series going simultaneously that require different types of energy and resources. I pivot between them depending on my mood. This series was relatively easy to do (especially when compared to my animal feast series!). It was a more calm, focused and meditative experience. I think it is important to diversify the type of work you are producing so it doesn’t become too monotonous. 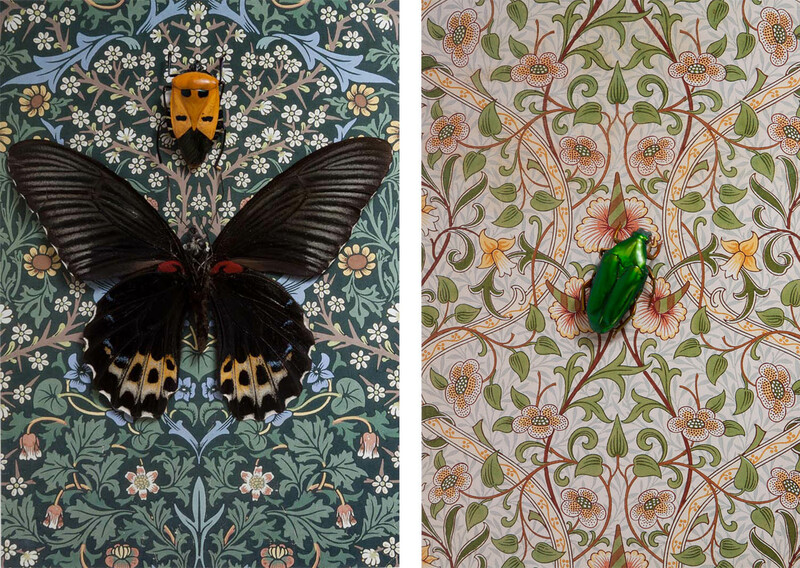 You say this series is a continued exploration of the cycle of inspiration, so which came first, the bugs or the wallpaper? It’s hard to say, I wouldn’t call it a linear process necessarily. 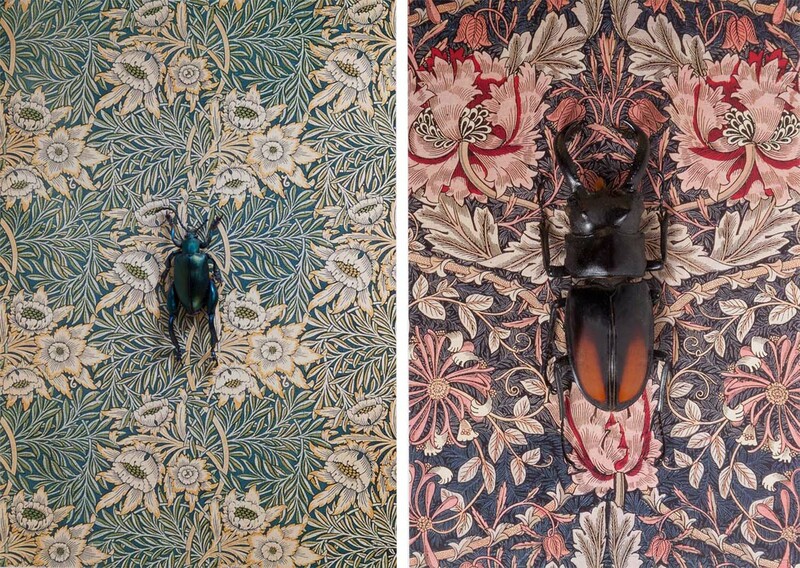 I have had a longtime interest in the aesthetics of both insects and wallpaper. It’s more of an ah-ha moment when you realise they should go together. The "continued exploration of the cycle of inspiration" I was referring to speaks more to the parent project with Birds of a Feather as the kick off to this type of work. Working on multiple series at once, do you find yourself getting ideas from one project to add to another? Absolutely, they can’t help but influence each other - it’s a wonderful part of the creative process. More importantly, as many of my projects are self-funded; I have to make the most of all of the opportunities presented to me so I try and combine resources to get the most out of my shoots. For example; I may use the same animal for three different series; a portrait on a background, an animal feast (The Fantastical Feasts), or with The Traveling Mouse etc. I found photography in my early years at Bard College at Simon’s Rock. Photography gave me a voice and outlet for expression. The artwork born of that journey continues to shape my identity and my life. For photographers, the creation of an image is an exploration of the world around us. Making pictures allows me to explore the world, work out how I feel about it, and find my place within it. Photography is a passport to investigate and explore limitless topics. Where in the world are you and what’s next for you? I have had a very good year for travel with recent adventures in Morocco, South Africa, and India so my next adventure is less exotic but a very exciting move to a historic farm in PA where I will continue to make my work and host artist-in-residence and educational retreats on a host of artistic subjects beyond just photography. It will take some time to get up and running but I will be posting about the progress on my instagram account @clairerosenphoto. In the more immediate future, I have a book coming out on artistic practice in photography called, IMAGINARIUM: The Process Behind the Pictures, published by RockyNook to be release in December 2016. It is a compendium of practical advice and information covering the photographic process—from idea cultivation through execution. It brings together strategies and tools to help readers generate compelling ideas and create unique images. From the simplest idea to the most fantastical, the book covers brainstorming, concept development, pre-visualization, pre-production, problem solving, and execution steps in the creative process.